Within the festival ‘ Tajamo’ Qudsna’, a tournament of the departed Hani Al-Halabi was organized and consisted on football matches between four Jerusalemite clubs which were Burj Al-Luqluq Club,Palestinian Academy for Talented Footballers, Mount of Olives Club and Sur Baher Club. 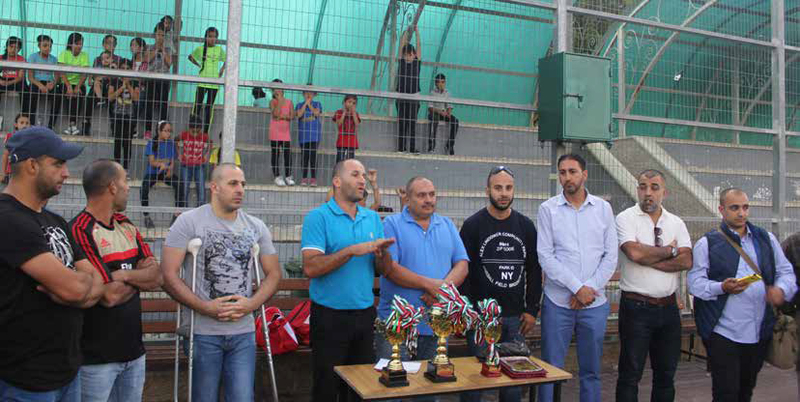 The tournament was settled on Burj Al-Luqluq pitches, sponsored by the Jerusalemite business man Mounir Al-Ghazali and was for participants whom were born in 2005. Moreover, the tournament was conducted on point obtaining basis by which Sur Baher team has won it by 6 point lead with goal differences in comparison with Palestinian Academy for Talented Footballers. Otherwise, Mount of Olives club came in the third place and Burj Al-Luqluq Club came in the fourth place. At the end of the tournament, representative of Tjamo’ Qudsna ‘Said Misk’, representative of Palestinian Academy for Talented Footballers ‘Firas Abu Mayaleh’ and Burj Al-Luqluq sport advisor ‘Nihad Zughaiar’ have presented welcoming speeches and thankful words for the participants and for the crowds.